2017 Drew Family Cellars, Pinot Noir, Morning Dew Ranch, Anderson Valley. 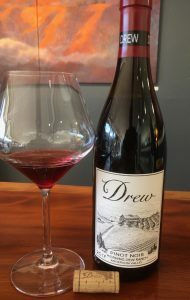 The new Drew Morning Dew Pinot is an amazing wine, I cannot recommend their wines more highly and this 2017 vintage looks to be one of the best all around yet, this one highlights the year, the sense of place and proves to be a wine of substance and delicacy. Without question Jason Drew is making some of the great wines in California these days and over the last few vintages his Pinots are almost unrivaled, especially his Mendocino Ridge and cooler Anderson Valley sites, not just his estate offerings, but those from Wendling and this Bert William’s Morning Dew Ranch are absolutely stunning as well. These Drew wines are complex, translucent and full of vitality with pure and precise detail paying exceptional attention to the vineyard as well as showing an x factor in the glass. It was with massive expectations I counted the minutes to get the latest releases from Drew that included the Valenti Syrah, the Wendling Pinot and of course the Morning Dew Ranch bottling, that was missing from the last vintage and for which I was most excited to getting. The Morning Dew Ranch, the retirement project from the iconic Bert Williams the founding winemaker of the famous Williams Selyem Winery, sits in the deep end of Anderson Valley, located on a south west facing hillside up at about between 600 and 800 feet in elevation on Franciscan Series soils, which are are well-drained, slowly permeable marine sediment and a mix of rock including schist, sandstone, basalt and shales on mountains and uplands of the coastal ranges. Williams planted his vineyard, and Drew uses both a Rochioli clone and a 828- La Tache selection, with Jason choosing two separate blocks on the hillside. In this 2017 vintage Drew went with about 15% whole clusters along with only native yeasts during fermentation, with gorgeous results, the resulting Morning Dew Pinot is bright and with a garnet and ruby hue in the glass, and even with the heat spike near Labor Day, the balance is impeccable and the natural alcohol came in at a refined 13% with yields kept tight at just 2 tons per acre adds to the concentrated mouth feel and depth of dark fruit on the medium bodied palate. Jason also went with 11 months in barrel only racking by gravity twice before bottling, and he used most well season French oak here with just 20% new in the final blend of this thrilling new Morning Dew Ranch. This is just awesome stuff to enjoy for the 15 to 20 years, I am so glad I got more than one bottle, as I want to re-visit this in 10 years, its potential seems off the charts. The invigorating youthful nature hides an underlying class and dimension that will certainly prevail in the coming years, that said with air it is impossible to deny the greatness here, the nose alone seduces the senses with floral intensity and exotic red fruits leading the way to the satiny mouth with black cherry, plum, pomegranate and wild vine huckleberry fruits forming a core profile along with light toasty mocha and cola bean elements, cinnamon, brambly/briar spices, mineral tones, framboise, earl grey and a sensation of candied citrus and racy currant that helps add a slight tangy to the generous ripeness here. The youthful creaminess ebbs away with air and this wine gains a serious structural quality that is backward, but hints to the glorious future in store for Drew’s 2017 Morning Dew Ranch, reminding me of great Volnay wines, though to be honest, this is a California wine through and through and even the Burgundy guys would be hard pressed to make a wine of this kind of intrigue, beauty and incredible refinement. This was my first 2017 from Drew, I can hardly contain myself thinking about the rest of his lineup, if you are not on their list, you need to be.